Our lathes are precision engineered to provide accuracy and reliability. Sturdy construction and technologically driven designs give Dechert Dynamics Corporation equipment an edge above the competition. By partnering with us, you will receive a final product that has undergone advanced assurance checks, with multi-point inspections throughout production. Our Cincinnati Milacron Cinturn Series 2200 features a 850SX CNC control, a 75 HP chucker with 20-inch chuck capacity, a 6.3-inch spindle bore, and 32-inch maximum swing. This machine operates on 24-inch diameter turning, which can hold up to 43 inches on the Z-axis. A swing up tail stock and 10 position turret round out the features of this lathe. The Lodge & Shipley offers a 25-inch diameter swing capacity at 12-foot centers. This lathe features a Minnich tracer with a grinder attachment. The South Bend Model CL 170-E includes a 17-inch diameter swing capacity and 8-foot centers. Our 6-inch South Bend Bench Lathe features the signature South Bend V-way bed and standard jaw scroll. Since 1946, Dechert Dynamics Corporation has served Pennsylvania with a variety of machining capabilities. We have the technical service knowledge needed to machine parts for very technical applications using difficult materials. Dechert Dynamics Corporation has earned an ISO 9001:2015 certification, so our customers have peace of mind that we maintain the highest quality standards and thorough documentation. 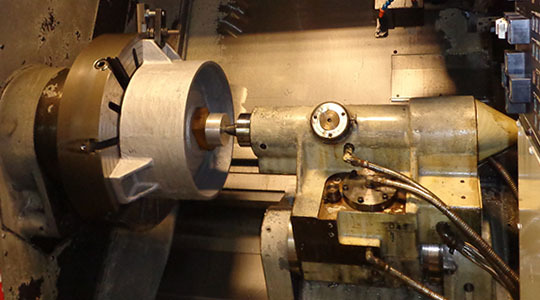 Contact us today to discuss your lathe machining needs and our machining capabilities.